It’s a well-known fact that we know more about outer space than we do about our oceans here on earth. With only about 10% of our oceans mapped out, we could use some help getting the facts on the waters that cover more than 70% of our planet. 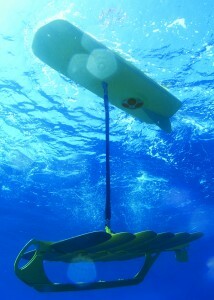 On November 17, 2011, a couple pairs of robots called the Wave Gliders left San Francisco’s St. Francis Yacht Club to embark on a record-setting journey across the Pacific ocean.The 4 bots will travel together until they reach Hawaii where they will then pair off heading to Japan and Australia. Through out their journey, the bots will collect data on salinity, water temperature, waves, weather, fluorescence, and dissolved oxygen. The company Liquid Robotics has made this investment to show off the fortitude of the Wave Gliders however, beyond that, they aim to stimulate people’s imagination on what can be discovered about our oceans through the use of networked sensors. In line with this goal, over 2.25 million discreet data points collected by the bots will be made available to anyone in the world via Google Earth. This entry was posted in Robots and Research, Robots and the Environment, Robots Around the World and tagged Google Earth, Liquid Robotics, Ocean Monitoring, Wave Gliders. Bookmark the permalink.